Dubai: Access to and from Dubai International City (DIC) will further ease from Saturday, as phase two of the road projects around the neighbourhood opens, the Roads and Transport Authority (RTA) announced on Wednesday. Phase one of the Dh400 million roads upgrade in and around the densely populated neighbourhood opened in July last year, coming as a major relief for motorists in the area, who have been cramped for space for years. The project, that was carried out in two phases, is expected to improve traffic flow, reduce journey times and boost safety. Supporting more than 110,000 residents and 200,000 visitors, the project includes widened roads, new flyovers and multi-tier interchanges as well as upgraded signalised junctions around Dragon City, International City and Warsan Village. For the DIC residents, who have long been facing traffic jams and congestions, the new roads have opened up a new horizon. The Dh193m phase two that opens on March 30, includes upgrading of the intersection connecting Al Manama Street and Nouakchott Street as well as upgrading Al Manama Street and Mohammad Bin Zayed Road interchange and Al Manama Street and 414 Street interchange, which is the main entrance to DIC. Phase two will also see widening of the flyover passing over Mohammad Bin Zayed Road from three to four lanes in each direction, which according to RTA, will increase the capacity of the bridge from 4,500 vehicles per hour to 6,000 vehicles per hour. The second phase will also see an increase in the number of lanes of slipways extending from Ras Al Khor Road to Sharjah, and from the International City to Jebel Ali and Abu Dhabi, from one lane to two lanes. “The widening will double the capacity of these lanes from 800 vehicles per hour to 1,600 vehicles per hour,” said Mattar Al Tayer Director-General and Chairman of the Board of Executive Directors of RTA. Additionally, a stretch of the Al Manama Street between Mohammad Bin Zayed Road and the entrance of the International City will be expanded from three to six lanes in each direction. “The expansion will increase the capacity of the road by 1,500 vehicles per hour per lane. Al Manama Street will also be widened in the sector from the entrance of the International City to the Academic City Street from two to five lanes in each direction. This will enhance the capacity of this sector from 3,000 vehicles to 7,500 vehicles per hour,” he said. The Al Manama Street-International City intersection will also see an upgrade, which will include a signalised junction enabling free movement in all directions a well as a flyover of three lanes in each direction to allow traffic to cross freely over Al Manama Street, increase the capacity of the interchange by 4,500 vehicles per hour. The upgrade also includes improving the existing surface intersection of Al Manama with Warsan Street 1 (ex Nouakchott Street) to a signalised junction enabling movement in all directions. 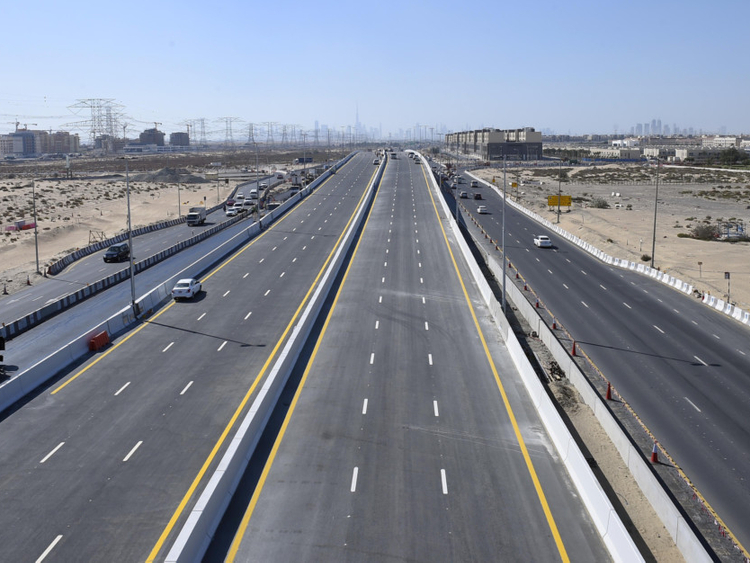 A two-lane flyover has been constructed to serve the traffic from Warsan Street 1 to the left in the direction of Shaikh Zayed Bin Hamdan Al Nahyan Street. It will increase the capacity of the intersection by 3,000 vehicles per hour.